Grateful for their freedoms, 53 pilgrims enjoyed the first Thanksgiving nearly 400 years ago in Plymouth, Mass. They were survivors of the original 100 separatists from their arduous Atlantic Ocean journey aboard the Mayflower from Southampton, England. Originally, their destination was Virginia, but they disembarked in Massachusetts. It was a severe winter. But they survived with the help of Native Americans, who taught them valuable lessons – how to live off the land. 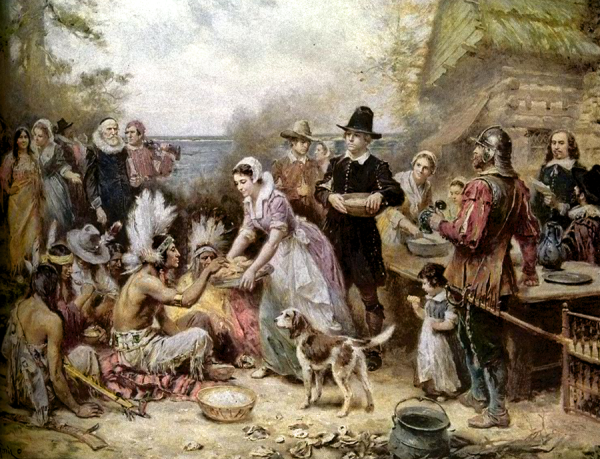 A year later in 1621, for three days, the pilgrims and Indians were able to celebrate their good fortune. Initially, it was a religious Thanksgiving. Over the years Thanksgiving became an American tradition as an opportunity for gratitude – enjoying a plentiful meal with family and friends – all while giving thanks. President Lincoln declared it a holiday in 1863 on the third Thursday of November. It was switched to the fourth Thursday during the 1940s. So with the exception of some professions such as journalism, airlines, first responders and healthcare, it’s been a holiday. But in the quest for profits that’s changed. Initially, it was just workers in retailing have to work Thanksgiving to prepare for Black Friday. That’s the day retailers start earning green in the holiday shopping season. It’s one thing to be altruistic to serve Americans who need prescriptions for their illnesses. But many retailers open on Thanksgiving to jump start Q4 sales. There have been many indicators many people can’t take advantage of such sales. We’re turning into a nation of haves and have nots. We seem to have forgotten about America’s Hoovervilles. In pointing a finger at President Hoover for his inability to prevent economic chaos, Hooverville was a term coined by Democrats to describe the shanty towns of unemployed Americans. Old newspapers that were used to keep unemployed people warm were referred to as Hoover blankets. Worn out shoes were lined with cardboard and called Hoover leather. In 1932, World War I veterans marched on the nation’s capital. Twenty-five percent of the nation’s budget had been swallowed by veteran benefits, but many veterans were destitute from unemployment. They demanded early payment for their benefit promised for 1945. Economic hardship exacerbated by a drought, forced thousands of Oklahomans to seek a better future – dignity, jobs and land – by migrating to California. For poignant visual reminders, see this photo essay. Fast forward to today. Since the election of President Trump, the unemployment rate has dropped to 4.1 percent and the stock market has added more than $4 trillion after expanding 27 percent. However, some 100 million Americans are either in poverty or close to it, according to the U.S. Census Bureau. Forty-three million Americans are on food stamps. We’re not talking about new immigrants. We’re talking about nearly 33 percent of Americans – most have high school or college educations. Many can’t get a job or they’re under-employed. Many are baby boomers whose jobs disappeared in the new service economy. Others have suffered from deteriorating living standards and moribund wages. It’s true many have not prepared for globalization and the digital age (Study: Unemployment Stems Partly from Deficient Worker Skills, Education). But there are other reasons. Unlike the New Deal policies of Franklin Roosevelt, the federal government is a hindrance. The trade deficit is out-of-control. So is the federal budget deficit. ‎Additionally, consider federal regulations. Cabbage, for example, is a commodity many will enjoy on Thanksgiving. However, the U.S. government bureaucracy uses 26,911 words to regulate it. Compare the cabbage example with the Declaration of Independence: A mere 1,300 words. Or how about the U.S. Constitution and its amendments: 7,818 words. Politics – an infinite pursuit for power – stands in the way of prosperity. Under Sen. Harry Reid’s “leadership” during the tenure of President Obama, not one budget was passed. Their political party still stands in the way of a balanced budget and encourages attitudes of entitlement. Seven million men in their prime – aged 25 to 54 – don’t have a job and aren’t even looking for work, according to published reports. As a result of economic dysfunction, unproductive trade policies, waves of illegal immigrants and an unhappy electorate, Donald Trump was elected as a culture-war president. The nation is polarized. The economy has improved dramatically under President Trump’s leadership –leading economic indicators are now positive. The gross domestic product growth of 3 percent is three times higher than the average of the eight years under President Obama. But divergence of the poor and affluent is a huge threat. It’s a menace to our nation’s core values as expressed in our Declaration of Independence – because we’re failing to honor a legacy. The pilgrims of 1621 showed us the way. They didn’t let politics and poor public policy disillusion them. They found a way to exist harmoniously with their Native American neighbors, worked hard, practiced stewardship of their assets and reaped a bountiful harvest. That’s why they had reasons to celebrate for a happy Thanksgiving. When will we have valid reasons to celebrate? Today, the pilgrims would be aghast. Memorial Day: What Would Abraham Lincoln Say Today? — Memorial Day is to remember the armed forces’ men and women who died to protect our freedoms. Some reflection on what Abraham Lincoln would say today.